Six strikes by the Kalibr cruise missiles were conducted against Daesh terrorists in the Abu Kemal area in Syria by the Russian military forces. Russian long-range Tu-22 bombers and Varshavyanka class submarine "Kolpino" on Friday struck a massive attack on Daesh terrorist group (banned in Russia) in the Abu Kemal area in Syria, official representative of the Russian Defense Ministry Maj. Gen. Igor Konashenkov said on Friday. According to Konashenkov, the Kolpino sub launched a total of six Kalibr cruise missiles from an underwater position in the Mediterranean Sea to a distance of over 650 km (some 403 miles). Meanwhile, Su-24 and Su-34 fighters were also involved in the strike under cover carried by Su-30SM, Su-35 and MiG-29. About 18 airstrikes and 9 sea-based cruise missile attackes have been waged in the past three days, as Konashenkov said. Missile and air strikes on the Daesh militants paved the way for the active military operations against the Syrian troops under the command of General Suheil. Meanwhile, Russian military has targeted Daesh positions in the town of Abu Kemal in the province of Deir ez-Zor for the second day in a row. The Russian strategic bombers had launched a massive strike on Daesh's arms and ammunition depots, command posts and fortified areas. Recently, a Russian submarine launched a strike with the Kalibr cruise missiles from the Mediterranean on the Daesh targets in Abu Kemal to help the Syrian army's offensive on the ground. 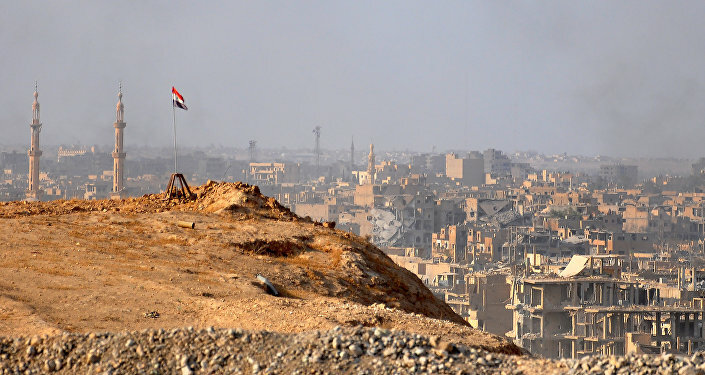 Moreover, Russian authorities reported that over 90 percent of the Syrian territory has already been freed from terrorists and, according to Russian Defense Minister Sergei Shoigu, the Russian military campaign will be completed soon.